Movie Night came recommended to me by someone who works at a DavidsTea when I said I was open to “trying anything” (that wasn’t made with a rooibos base). The name intrigued me, the concept intrigued me, the idea of popcorn in my tea wasn’t actually off putting enough to stop me from buying a small bag to try this one out. If you’re wanting to try small amounts of a tea, I’d highly recommend going into a store if you’re able to have them weigh the tea out for you. I always get small amounts when I’m first trying out a tea. There is nothing worst than getting a full 50g (2oz) and realizing you wouldn’t wish it on your worst enemy. I got 14g of Movie Night to try. 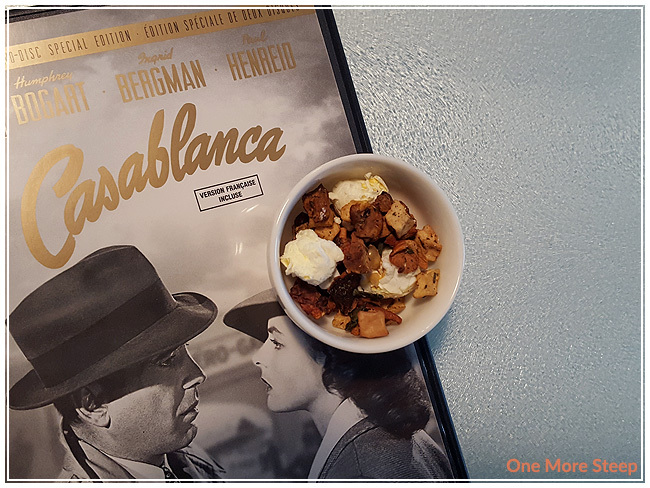 The ingredients of Movie Night are: apple pieces, green tea, popcorn, and flavouring. As you can tell in the above photo, it looks like it is all apple pieces and popcorn. Green tea really takes a back seat in terms of being prevalent in this tea. 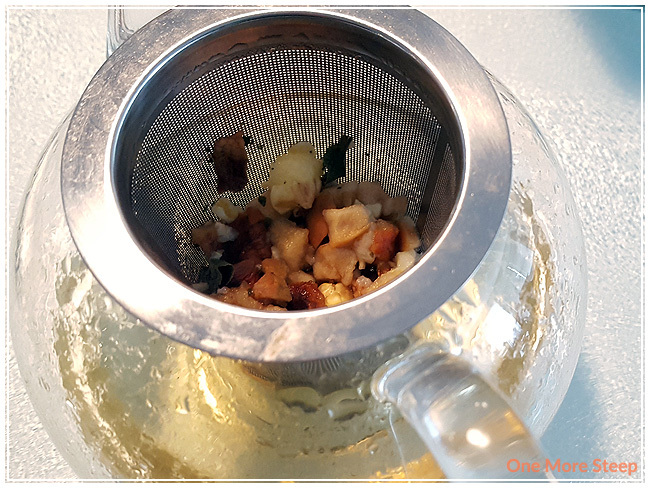 The dry tea has a strong popcorn smell to it that mingles well with the apple. 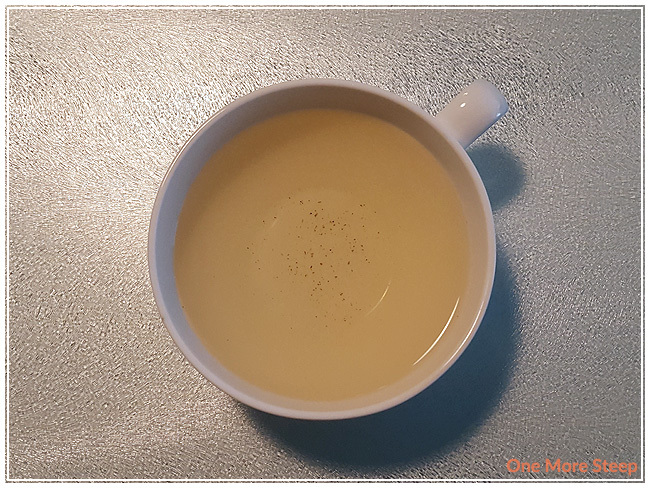 It feels like it would be a good tea to have in the autumn if you’re wanting an alternative to apple cider. The order of the ingredients is highly reflected in the actual tea itself as typically the ingredient in the greatest abundance is listed first – apple is definitely the star when it comes to quantity. I cannot make out the green tea base at all when it comes to smelling the dry leaf. 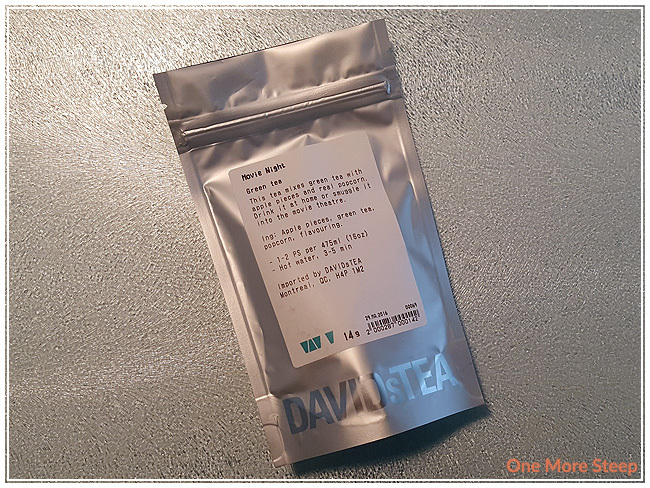 DavidsTea recommends steeping Movie Night in hot water (167-176°F or 75-80°C) for 3-5 minutes. I used my Breville IQ Kettle for heating up the water to the ideal temperature, and steeped for about 4 minutes. Movie Night steeps to a light yellow, and there’s a beautiful buttery popcorn scent that mingles well with the apple. Still evokes thoughts of autumn for me (it’s probably because of the apple). The tea itself is very sweet, I’d say it’s because of the natural sweetness of the apple, along with whatever flavourings had been added to the tea itself. 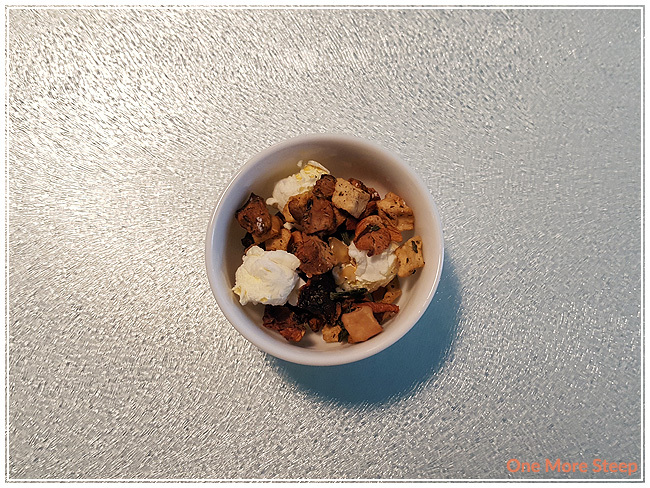 There’s more of a buttery apple taste to the tea than there is any popcorn (aside from the butter). The popcorn is a little bit lost in this one. Apples all the way in this steeped tea, which is odd to me because I feel like the popcorn should be the front runner in terms of the flavour profile due to the name of the tea. I attempted to resteep Movie Night, it did not go well as the tea itself had a lost a lot of the flavouring with the first steep. I would not recommend resteeping Movie Night. I thought that DavidsTea’s Movie night was just okay. This was a tea that just did not meet my expectations. With a name like Movie Night, it makes me think of hot buttery popcorn not apples, which was the predominant flavour in the steeped tea. That said, Movie Night was tasty and makes a nice sweet treat and makes a good apple flavoured tea. The flavours need to be changed to better mimic popcorn in the actual steeped tea (although the dry leaf does an excellent job with the butter popcorn smell). DavidsTea will occasionally “retire” (discontinue) teas, I think that’s what they’ve done with Movie Night.